As practice has shown, this organization has never failed to give an accurate analysis of political events deemed important for the struggle of world proletariat for socialism, from wars on Syria, Palestine and Libya, over the coup in Zimbabwe, aspirations for secession in Rojava, Kosovo and Catalonia, economic pressures on DPRK and Venezuela, to the First world social imperialism of Sanders and Corbyn. That analytical superiority derives as much as from the ability to apply the theoretical knowledge on those events, as from the constant development of that theory, paying attention to notions of time and place and regarding the changes in national and global conditions of the constant economical evolution. Yet, the factor to accentuate is that of the class character of our members in both national and global terms, which gives no room for mistakes or failures, considering the stakes for organizations in neo-colonies are much higher than for those in First or Second world countries. With responsibilities, therefore, being larger, any sort of speculation denied by the reality on the ground must result in severe sanctions, even to the point of removal from the organization. Which is why we were astonished to find that even some of the Third Worldist organizations who, unable to grasp the role of Greek Syriza a few years ago, after promoting it as “progressive”, never underwent the self-criticism process (a practice long abandoned by the Marxist organizations). On the other hand, unlike Trots and Maoists who are constantly firing blanks, the only other Western leftist organizations not to take part in the imperialist interventions across the Third World are the so called “Stalinists”. When we say “taking part”, it’s obvious we consider the misunderstanding of material reality and mismanagement of available resources and the opportunities of action against imperialism as a direct help to imperialism. Although wrongfully named, since Stalin was a creative Marxist and they are merely a by-product of Stalin’s compromise with the West in order for the USSR to gain some breathing space after the WW2 and pursue the revolutions in the East (which is why they got stuck in legalism and never developed a parallel apparatus of action), these organizations tended to show the greater understanding of the very nature of imperialism and continuously defended the progressive governments in the Third world under the attack by imperialism. However, that “defense” was merely vocal, and not sufficient to greatly impact those events, since their political achievements at home, even after many decades of organized struggle, are hardly worth a mention. That is, of course, of no surprise, as the theory they rely on hasn’t developed since the 1950-ies and is of little or no relevance today in terms of understanding the mechanisms of world polarization and its economic consequences, which in return shape the aims and methods of class struggle accordingly. Yet, their continuous rejection of reactionary positions on imperialist interventions and spurs or support of social unrest that often precedes those interventions, tells us the theoretical writings of Lenin and Stalin are almost quite sufficient to adopt the correct attitude towards the events developed out of the imperialist need to partly restructure the world economy after the collapse of the USSR and prevent the tendencies of certain peripheral countries to reject the global division of labor and, partly or fully, delink from the way the global economy is run. That is, if interpreted correctly. Although immune to Maoist type liberalism on the one side, it’s clear they’re not resistant to Trotskyist type idealism on the other. Unfortunately, it’s not some junior party members we’re referring to here, but the actual leadership itself – supposed to be the cream of the crop of the modern socialist thought. To briefly address that attitude by both theory and practice, let’s start by pointing out that one cannot be against something and for nothing. Marxism is about dealing with objective antagonisms not imaginary scenarios. More plainly – basing one’s position on the statement by marginal forces is what it’s not about (Tudeh party leadership is based in exile and its influence amongst the Iranians at home is barely worth a mention). And that’s how we got the so called “Stalinists” sharing goals on Iran with Donald Trump and Benjamin Netanyahu. But wait, just to be on the safe side, they quickly published another statement by the Tudeh, which expressed the opposition to “any kind of foreign intervention”.8 In a parallel universe Trump and Netanyahu both read it and discussed it over tea, then decided to carry it through as the means of achieving peace and stability in the Middle East. Now let’s take a look at the historical practice, for unfortunately, to the anti-materialists, etiam repetitio est non mater studiorum. In 2003, amidst the imperialist sanctions and all sorts of pressures on the Iraqi government, just before the Western military aggression, the Iraqi Communist Party called on “social and political forces to take political change into their own hands in order to topple the ‘dictatorship’ and set up a democracy”. However, it announced the opposition to “any kind of foreign intervention”.9 In 2011, after the Trots expressed their support to the Libyan opposition protests, they emphasized the rejection of any foreign involvement, and pointed to some of the protesters with banners upholding similar views.10 And how about a more recent event, when just a few months ago the Communist Party of Zimbabwe, based in South Africa, called for “the people” to march down on government buildings and help the military topple Mugabe?11 As you may know, all of that went down well: the Iraqi Communist Party was rewarded by 1 out of 328 seats in the neo-colonial Parliament of Iraq after the intervention; Libyan opposition succeeded in bringing the country to the state of dependency, whilst their Trotskyist spokesmen transferred their analytical “skills” to Syria; and the Zimbabwean communists are still to release a statement on Zimbabwe applying to rejoin Commonwealth and first cases of “returning” the land to the settler-colonists – except they temporarily run out of ink. Did they think history will not hold them accountable? But enough with references to “infantile disorders”. 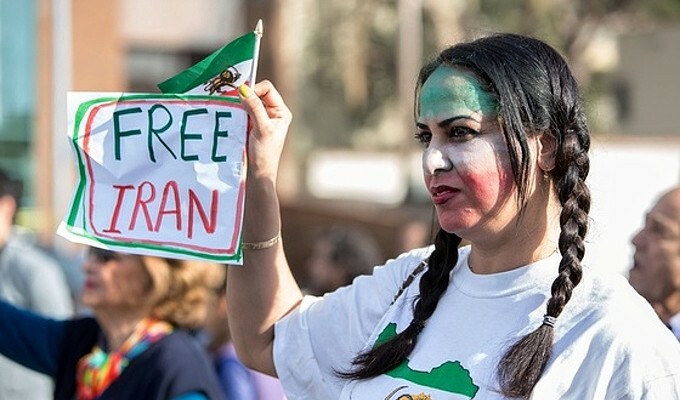 Shall we give a few accounts on protests in Iran ignored by the pro-imperialist left? Most of the protests included chants “bless your soul” and other slogans praising Reza Shah whose dynasty was deposed in the Iranian Revolution.12 Protesters also shouted slogans praising Reza Pahlavi, Crown Prince of Iran.13 Other dominating slogans include “Let go of Palestine”, “Not Gaza, not Lebanon, I’d give my life only for Iran” and “Leave Syria, think about us”.14 Are these not all pro-imperialist slogans? And how do “socially driven” protests with “large sections of working class” end up aiming at re-establishing the pro-imperialist monarchy and supporting Israeli settler colonialism? The answers are quite simple. Yes, the protests were initially socially driven, and have started as a gathering instigated by the younger opponents of Rouhani in the conservative city of Mashhad in eastern Iran, caused by the general rise in prices and draft budget, presented to parliament in December, that would have cut subsidies for the poor, if adopted.15 Although at first not aimed at a radical change, once the protests spread and gained momentum, by inclusion and dominance of other social strata, they gradually became political and tended to misinterpret the causes of financial hardships of the bottom layer as consequences of the anti-imperialist aspect of the government’s policies. Whether it’s the CIA and Mossad operatives that should claim the credit or the organized liberal groups constituting the “pro-American” element is hard to tell, but what’s easy is concluding who the objective forces are and aren’t. Since then, the demands shifted to “down with dictator”, “let go of Palestine” and “bless Reza Shah”. So, there’s the answer, if it insofar wasn’t clear, whether the “alternative to the mullahs and imams has to be the Yankee”. As we haven’t seen any concrete analysis from the statement of the General Secretary of TKP, except plain claims that the “regime” protested is itself “reactionary”, it’s difficult for a proper Marxist not to wonder – compared to what objective force? Or have the so called “Stalinists” finally adopted the Trotskyist slogan of “Neither NATO nor Gaddafi” and “We support the (imaginary) people”? But Iran’s response to exclusion from the world financial markets was equally efficient. Although initially burdened by sanctions, that exclusion actually helped Iran to avoid recession in the aftermath of the 2008 global financial crisis. To continue on the path towards becoming upwardly mobile, even under sanctions, the country transferred its strategy from “seizing a chance” to “development by invitation”, which is why the net flow of foreign direct investment (FDI) into Iran has grown. That was made possible by Iran’s successful and increasing reliance on ‘South-South’ trade, which effectively translated into its own sanctions against the West.26 It’s former strategy, as Third Worldists should know, also carries some of the inherent problems, given that industrial development suggests to import both machinery and semi-finished reproduction materials from the core countries, essentially replacing the old dependency with a new one. That’s how Germany became Iran’s key trading partner, and even Iran’s nuclear program depended mainly upon German products and services (for example centrifuges used to enrich the uranium are controlled by multi-purpose automation hardware and software made by Siemens).27 Yet, as interdependence would have it, the economic sanctions against Iran were to cost more than 10,000 German jobs and have a negative impact on the economic growth of Germany,28 which beamed for a shift in German business ties with Iran from long-term business to short-term and from large to mid-sized companies. Has Iran succeeded in defeating the effects of isolation by managing to build a self-reliant economy? Not exactly. But the possible effects of that strategy surely accelerated the P5+1 efforts to secure the deal with Iran which would reintegrate it into global economy. So actually, the West thought it might and Iran thought it mightn’t. The so called “Nuclear deal”, which reduced the country’s uranium stockpile by 98% and directed it to Russia39 and China40 for its nuclear energy, pretty much assured that Iran would not relink into the world economy on its own protectionist terms as a self-reliable economy nor as a military super-power. The new administration of Hassan Rouhani and the IMF both had a role to play in that process,41 and are managing the so called “transition to the market economy”.42 In return, the transition slowly takes its toll on the bottom strata, recreating “healthy” conditions for the class struggle in national frame, which the latest protests were a fruit of (well, at least initially). But not so fast. Additionally to the obstructions by the parliamentary opposition and remnants of legal obstacles to carrying out the transition in full, unfortunately for Rouhani’s clique, the new “dotard” led US administration has its own geopolitical reasons for prolonging the economic warfare on Iran. Iranian Privatization Organization (IPO) complains to be granted inadequate authority in the process of privatization and can’t overcome the pressure from the officials and the Parliament, nor the resistance of the state-owned companies.43 According to the IPO, merely a small fraction of state-owned enterprises, estimated at about 5%, have actually been divested to what would be regarded as the real private sector. On a broader, structural level, the private sector still only makes up roughly one-fifth of the economy. Meanwhile, 80% of fiscal spending is allocated to state-owned enterprises.44 Foreign investors can bid in Iranian privatization tenders, but need permission from the Economy Ministry on a case-by-case basis.45 After the threat of new US sanctions and a clear warning by Rex Tillerson to Europeans not to invest in certain Iranian businesses,46 a stream of major international corporations announced a departure from the Iranian market. For instance, the French company Total withdrew from developing the South Pars gas field, which is in the hands of the Revolutionary Guard. China National Petroleum Corporation replaced the French company but pulled out as well, and withdrew all its experts and workers from Iran’s Assaluyeh region.47 Additionally there’s the military threat to Iran’s regional interests conducted by the US/EU proxies, whether in Yemen, Syria or Palestine which Iran, unlike the West, cannot sustain on the long run and needs relatively quick victories in order not to endure significant damages to its budget. It’s not that hard concluding that if Iran’s going to relink, it’ll happen on the terms set up by the structural imperialism or it’s not going to happen at all. What to non-Marxist observers may seem as a paradox, which it is by no means, is that the process of delinking inevitably produces more progressive, both internal and external politics, and vice versa. In Lenin’s language, “the bourgeois nationalism of any oppressed nation has a general democratic content that is directed against oppression, and it is this content that we support”.48 That’s exactly what the Syrian communists understood perfectly in their determination to support the government under the attack by imperialism. As we have shown, Iran’s recent push towards the market economy opens up space for organized class and political struggle. That may take part on the streets, inside the parliament, even within the government, but most importantly it is the global class struggle that defines the objective political options inside the country at present. If leftists are going to engage it must be done by correctly interpreting the material reality from the anti-imperialist position and physical presence inside the country. Otherwise, if “the alternative to the mullahs and imams” is idealism of the marginal forces, then we’d rather have mullahs and imams”.